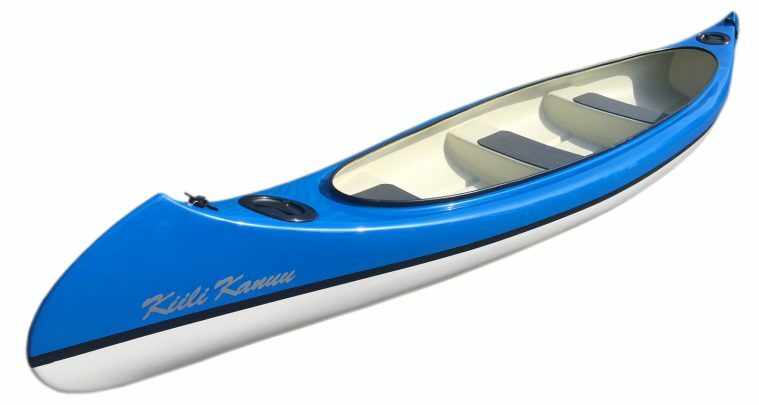 The Kiili Kanuu has three keels and a convex cross-section that ensures good righting and steady directioning. Airtight seats and compartments in the front and rear and ensure the security and insubmersibility for the rider. Water-repellent and anti-slippery seat covers can be added. Both tips of the Kiili Kanuu are similar; therefore, you can ride equally well both ways. When riding alone, the paddler is seated closer to the centre. When riding together the paddlers are seated face-to-face. When covering longer distances with the canoe, try paddling with the kayak’s two-bladed paddle to gain larger speeds using the same amount of energy. Due to the shape of the edge, water can be easily removed from the canoe.